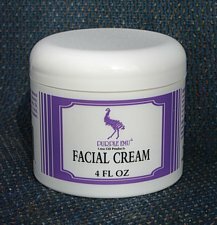 Emu Oil Facial Cream transports moisture-rich emollients to cells deep within the skin. Thickens the derma to help reduce the appearance of lines and wrinkles. Gently massage into skin until absorbed. Use daily. Ingredients Water, Mineral Oil, Stearic Acid, Cetyl Alcohol, Petrolatum, Ariacel 165, Emu Oil, Propylene Glycol, Citric Acid, Surfactant 190, Methyl Paraben, Propyl Paraben, Fragrance. ORDER ON-LINE To order a product please click on the add to cart button to the right of the product. When you have finished your shopping click on the view cart and then checkout button to complete your order. Transports moisture-rich emollients to cells deep within the skin. Light fragrance.